A new leader after today's Stage 7 up to the Genting Highlands. 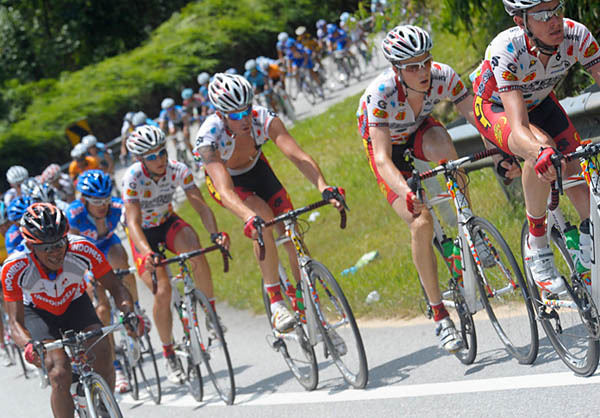 This climb is also used during the Tour de Langkawi and is reknowned for its difficulty and complete reworking of the GC. 3 Jai Crawford (Aus) Savings & Loans Cycling Team both at s.t. 8 Hari Fitrianto (Ina) Polygon Sweet Nice Team s.t. 17 Masaru Fukuhara (Jpn) Team Bridgestone Anchor s.t. 60 Kiel Reijnen (USA) Jelly Belly Cycling Team s.t. 93 Brad Huff (USA) Jelly Belly Cycling Team s.t.